Just got this email from the FC. 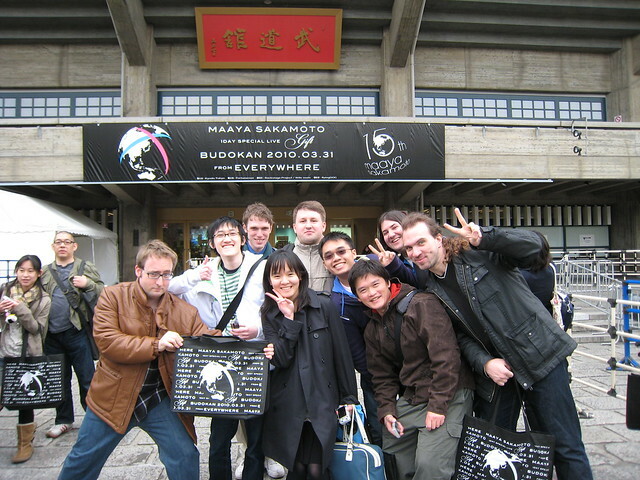 Announcing the start of the Sakamoto Maaya 20th Anniversary Project! -1st part: Sakamoto Maaya 20th anniversary tribute album "REQUEST". Participating artists and other details to be announced. -2nd part: Sakamoto Maaya 20th anniversary live "FOLLOW ME"
I'll try to do something for it. it's almost maaya's 20th anniversary!!! At Saitama Super Arena? Wow, that's huge. If someone could get me a ticket I'd go there for just one day. The same info was posted on the official site and had this as well. So the people who buy the single are entitled to participate in the presale? Last edited by Scoop on 2014-12-01 13:14, edited 1 time in total. Scoop wrote: At Saitama Super Arena? Wow, that's huge. I guess they will be able to participate in a lottery to be able to buy tickets before the official sales. Actually IDS members will be able to participate in a lottery between this Friday and December 15. I joined IDS one week ago, I hope I'll get one ticket! Let's do a meet-up like in 2010! Last edited by roxfan on 2014-12-01 18:38, edited 1 time in total. If someone will buy me a ticket (I'll give the money for it of course) and I manage to set up a short vacation end of April, I'll be there! It would truly be a dream come true. Last edited by Scoop on 2014-12-01 20:03, edited 1 time in total. I'll be getting some extras with my FC application and recommend other FC members do the same; with luck we'll have enough for everyone who'd like to come. BTW, the concert is just before the Golden Week which is the time when like half of the Japanese go somewhere else. So if you plan a vacation with the concert, it's highly recommended to take it *before* the concert, and book your hotels well in advance. Last edited by roxfan on 2014-12-01 20:27, edited 1 time in total. roxfan wrote: Let's do a meet-up like in 2010! Seems like kai is there too. And I think the most right position is jerome ?? Others Im not sure lol. I'm an American and a HUGE YK fan. I would love to go. How does buying the tickets actually work? I realize they are not on sale for a while. I also can't figure out the process for joining IDS. Anyhow, this is enough time that I can make this work. I've got to go. Last edited by kbmurphy on 2014-12-02 02:23, edited 1 time in total. I made a thread for the group trip/ticket purchasing planning. Last edited by Scoop on 2014-12-05 10:36, edited 1 time in total. I also wanna to be there. Akino arai "kiseki no umi"
Kirinji "uchuuhikoushi no uta "
Suzuki shoko "Saigo no kajitsu "
Next batch to be announced in a week. Last edited by roxfan on 2015-02-06 15:06, edited 1 time in total. Just realized the first one is Akino Arai!!! Wow!